With most Leicas costing thousands, the Sofort instant film camera is definitely the cheapest way of getting yourself a Leica camera. Its instax print analogue camera was first launched in 2016 in a pale green 'mint' finish – but is now can be found in a number of different color schemes. Now the Leica Sofort is being made available in black – and will be shown off at Photokina 2018 - but with the letters SOFORT written in large white type diagonally across the body. The camera uses the same widely-available instax mini film that is used by many other instant cameras, including Fujifilm's popular instax mini 90 and instax mini 70 models. The film is available in black and white, as well as color. The camera and film create credit card-sized prints measuring 54x86mm, which have an image area of 46x62mm. Four different shooting modes are provided – Automatic, Party & People, Sport & Action, Macro. There are options for multiple and time exposures, and the self timer provides two different delay trigger options. Selfies are made easier by the provision of a rectangular mirror on the front of the camera. The focusing can be adjusted manually, in any program mode, with the ability to set a macro (0.3-0.6m) or long-distance focus (3m to infinity). 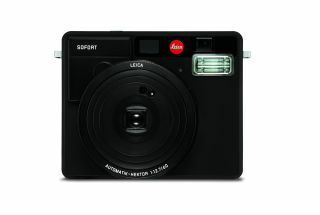 The Leica Sofort Black is available now priced £275. • What type of instant film do you need?